Many of the new smartphones that are being released at the moment are coming with NFC (near field communications) built in, Apple’s iPhone doesn’t have NFC and we have already seen a couple of different cases that will bring NFC to the iPhone. A company called DeviceFidelity Inc has developed an NFC based microSD card slot, that will bring NFC capabilities to Apple’s iPhone, the microSD card is used in conjunction with a special case for the iPhone. 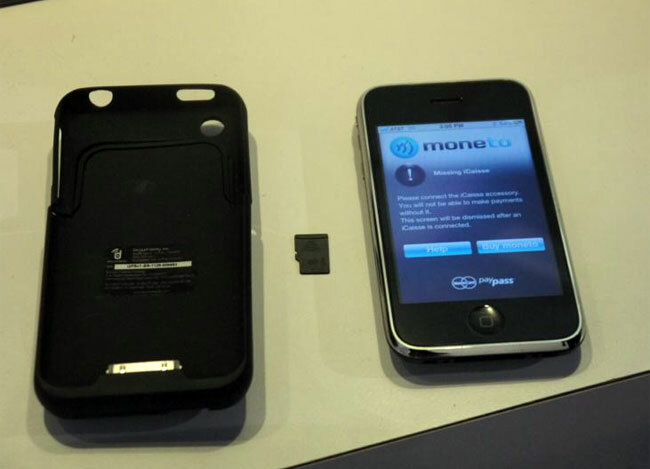 The system uses a service called Moneto, which is an NFC based payment service e and it can be used for making NFC payments with your iPhone and it comes with the microSD card and the case plus a $10 prepaid card, and it costs $79.95. The system uses a an iPhone application which is downloaded to the iPhone, the iPhone then communicates with the microSD card and you can then make NFC based payments with your iPhone. The NFC microSD card can also be topped up by wiring money to the account of the pre-piad card, and it looks like the company also plans to bring the service to Android smartphones that don’t have NFC built in.